Beauregard East of LA 27 from parish line northward to DeRidder and north of US 190 westward from DeRidder to Texas state line. Calcasieu East of LA 27 from Sulphur northward to parish line and north of I-10. Jefferson Davis North of I-10 and south of US 190. Lafayette West of I-49 and north of I-10. Rapides South of LA 465 to junction of LA 121, west of LA 121 and LA 112 to Union Hill and north of LA 113 from Union Hill to Vernon Parish line. St. Landry West of US 167. Vernon East of LA 113 to Pitkin, south of LA 10 to Allen Parish Line, west and north of LA 113, south of LA 465, east of LA 117 from Kurthwood to Leesville, and south of LA 8 from Leesville to Texas state line. Allen South of US 190 and west of LA 113. Beauregard West of LA 113 and east of LA 27 from the parish line northward to DeRidder and north of US 190 westward from DeRidder to Texas state line. 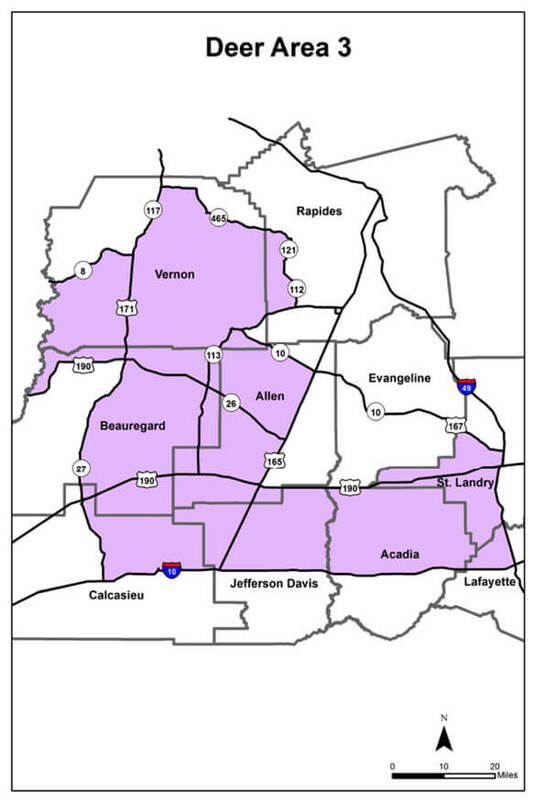 Calcasieu East of LA 27 from Sulphur northward to the parish line, and north of I-10. Vernon West and north of LA 113, south of LA 465, east of LA 117 from Kurthwood to Leesville, and south of LA 8 from Leesville to Texas state line.